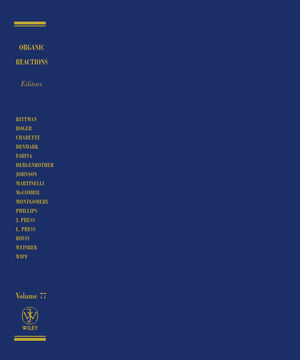 This new volume in the venerable Organic Reactions series comprises two chapters written in part by the inventors of the unique and important name reactions discussed in these chapters. The first chapter describes a truly remarkable transformation of carboxylic acid derivatives into heteroatom-substituted cyclopropanes, now known as Kulinkovich Cyclopropanation. The second chapter represents an homage to one of the giants of organic chemistry, Sir Derek H. R. Barton. This chapter covers the radical deoxygenation of secondary alcohols that has become known as the Barton-McCombie Reaction.